• NHK Creative Library is a free Internet service that provides video and audio clips ("creative materials") to our viewers for creative experiences. All creative materials available on this website are extracts from NHK's archived programs and footage. the Library. We plan to add pieces periodically. Use (e.g. non-profit usage, display of rights holder, etc.). • Using the "Create Video" page, even a first-timer can enjoy producing a video with ease. 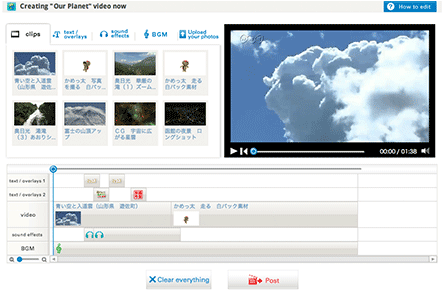 You can publish your videos on this website on the "View Work" page. • The content in the NHK Creative Library is a public asset built using receiving fees paid by our viewers. This Internet service is a way to return the benefits of the rich content in NHK's archives to the public. • NHK Creative Library's primary target user group is teenagers. We hope to help children develop their creativity, visual literacy, and awareness of copyrights by providing them with an opportunity and tools for producing their own videos.